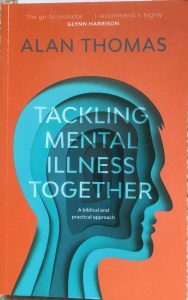 The author is ‘Professor of Old Age Psychiatry at Newcastle University and works as a consultant psychiatrist in the National Health Service’. He is also a ‘church elder with preaching and pastoral responsibilities’. Professor Thomas explains in the introduction that this is not an academic work (as other books he has written) but is for ministers and leaders in the Church. I’m neither, but my wife (Sue) worked for a counseling organisation for several years so I have an interest, albeit as a layman. Also, I have friends that have suffered from or are suffering from some sort of mental disorder and I have experienced in a small measure anguish of the soul and mind. I also believe an appropriate measure of understanding is called for, by Christians of other Christians, that suffer in this way. Professor Thomas is a Christian and is writing from that perspective. My first wife Sue, surrounded as she was at work with political correctness, humanistic thinking and opposition to the Biblical message would have very much appreciated this book. Just a personal preferential moan so I can get it out of the way. It doesn’t have an index, which is a little disappointing. It would have been helpful. I’m not a big fan of endnotes either but an additional bookmark works well. The endnotes give helpful explanations without being too technical and there’s a Glossary of the most used ‘technical’ terms. For what could be an incredibly dense text, given the subject, the style is easy to read with good divisions and (amusing) headings and at the end of each chapter he gives a bullet summary which again is really helpful. The book is in stark contrast to the Nouthetic (Biblical) Counselling of Jay Adams. Thomas lays out the Biblical teaching that we are all made in the image of God and designed for relationships yet fallen. Because we are designed for relationships the church can play an important part in the recovery (for some) and support of those in our churches that suffer from prolonged or continual mental illness. It’s often the carers that need the support. And these aren’t forgotten – especially in the last chapter. There are several unidentifiable but genuine cases referenced throughout the book with some personal (anonymous) testimonies towards the end. These help to make it all the more relevant. This isn’t fantasy. The more serious cases, such as of schizophrenia, aren’t going to be cured by repentance. There’s a very interesting chapter (ch 6) on Personal Responsibility and Mental Illness. The last chapter is probably the longest, and most challenging to our churches. I’m left wondering how equipped we are to help and support the mentally ill in our fellowships. How equipped am I?! I feel incredibly inadequate to the task because we will all have suffering Christians in our midst. One of the testimonies laments how when she had a heart attack there was prayer and support. But when she previously had a schizophrenic episode she was expected to ‘pull herself together’. She did say people were privately praying for her and their prayers were answered and that The Lord heard their prayers. Even so, the challenge is there. Physical illness and mental illness can be viewed very differently and yet both are consequences of our fall in Adam. I don’t want to give much detail because I want you to read the book and be taken along as he builds up his case. He recommends you read it from the start and not turn to the testimonies at the end first. I would agree with this. You need the previous chapters! I’m not a professional or a church leader but I hope the book has at least made me more aware (of treatments) and sensitive to sufferers (and their families) in our fellowships. I have enjoyed reading it. It’s been an informative, challenging and helpful read. From my limited perspective, I heartily recommend it. Church Ministers and Leaders should read it. Christians aren’t immune to any illness – including Mental Illness – that can overtake us in a fallen world. What of the Non-Christian that might read the book? They will have all the vicissitudes and pain of this life that will pale into insignificance compared with the awful pain of judgment to come unless they embrace The Saviour. It will be the opposite for the Christian; the suffering for the Christian will end and they will ultimately be ushered into the fullness of the Kingdom of Christ that He purchased at such cost – even with His own Blood.